These pigments would have been suspended in a binder, typically clarified egg white or animal or vegetable gums mixed with water. In Il Libro dell’Arte, Cennini describes mixing some pigments to create secondary shades, so the range of colors available to painters was broader than this; however other sources advise that many mineral pigments were incompatible with each other, so the range was not infinite. Cennini also describes the process of grinding minerals using a slab of a hard mineral and a hand-held rock, then mixing with egg white or gum to produce paints for use on parchment. 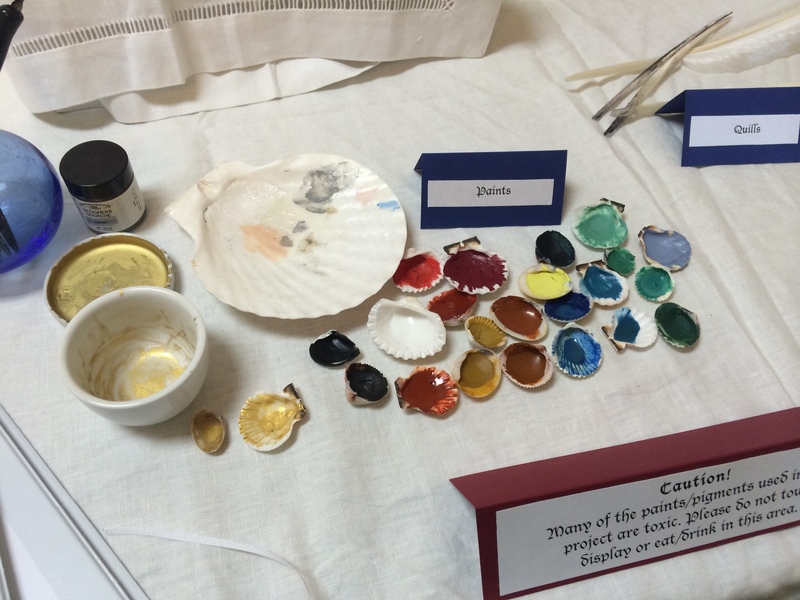 These prepared paints would have been stored in shells and either could have been used immediately or allowed to dry before being rehydrated as needed. Place a small amount (usually about half a teaspoon) of pigment on the plate. Add dry gum arabic. Mix somewhat using the palette knife. I haven’t found the single best answer for how much to use, usually I use 1 part gum arabic to 2 parts pigment. Grind gum and pigment together (still dry) with the pestle until they are equally blended. Add a drop of honey and grind slightly to mix. The honey was recommended by several of the modern guides I consulted. Honey is hygroscopic and I found that the paints in which I used more honey maintained a moist, shiny appearance in the shell. Add distilled water, one drop at a time, and grind/mix continuously using small circular (or figure 8) motions until it reaches an even, smooth consistency. How long this takes will vary by the pigment. Scrape the finished paint into the shell. It can either be used immediately or allowed to dry and then rehydrated, like pan watercolors. I found it easier to work with the rehydrated paints for most pigments, but needed to use the azurite freshly mixed. De Hamel, Christopher. The British Library Guide to Manuscript Illumination: History and Techniques. Toronto: University of Toronto, 2001.